Homeschool moms are busy. There is always a lesson to be planned, school supplies to buy, and a math lesson to teach. 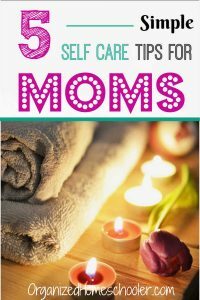 That doesn’t even include the mom and homemaker roles! Put a little effort into your Mother’s Day gift for the homeschool mom in your life to show them that you appreciate all that they do. Full confession – my husband and I are not big on gifts for each other. Gift giving just isn’t one of our love languages. Rather than a physical gift, I prefer to hear how much he appreciates my efforts at educating our children and smoothly running our house. Time together is also high on our list of priorities. Know the gift recipient. Know what she will consider an idea gift. Is it something practical? Something sentimental? Maybe not a ‘thing’ at all? 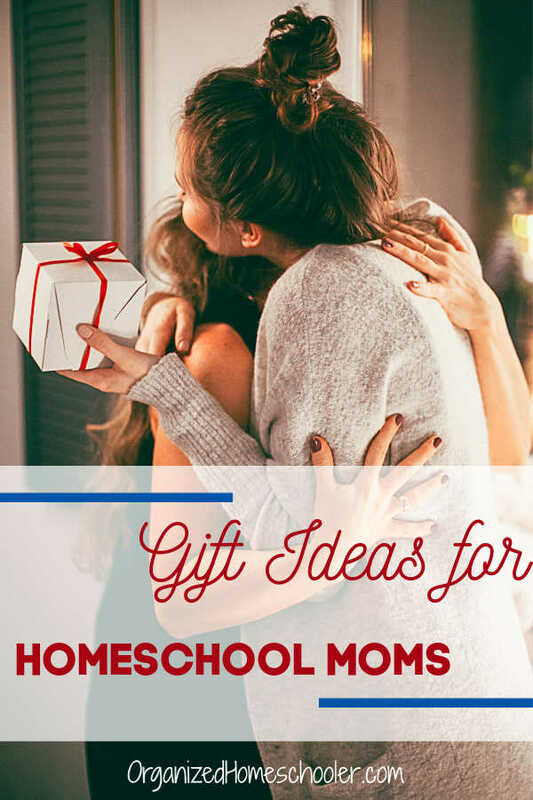 Mother’s Day is coming up soon and you might be scrambling wondering what to give the homeschool mom in your life. Don’t worry! I have a few ideas for you. I have had this Thermos travel mug for years and still absolutely love it. It keeps my hot coffee piping hot and my iced coffee nice and cold. I have used this almost every single day for the past few year and it still looks brand new. 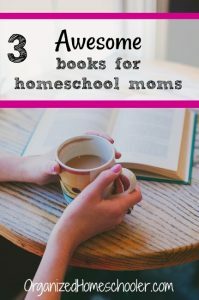 Hot coffee (or tea) is a must to keep homeschool moms running. Pair it with a fancy coffee or decadent tea. Homeschool moms don’t have a lot of free time. Honestly, that probably goes for ALL moms. They have to fit reading their own books in whenever they can. If they keep their Kindle Fire loaded up with books, they will always have something to read. The Kindle fire also plays videos so they can sneak in a show too. Already have a Kindle? 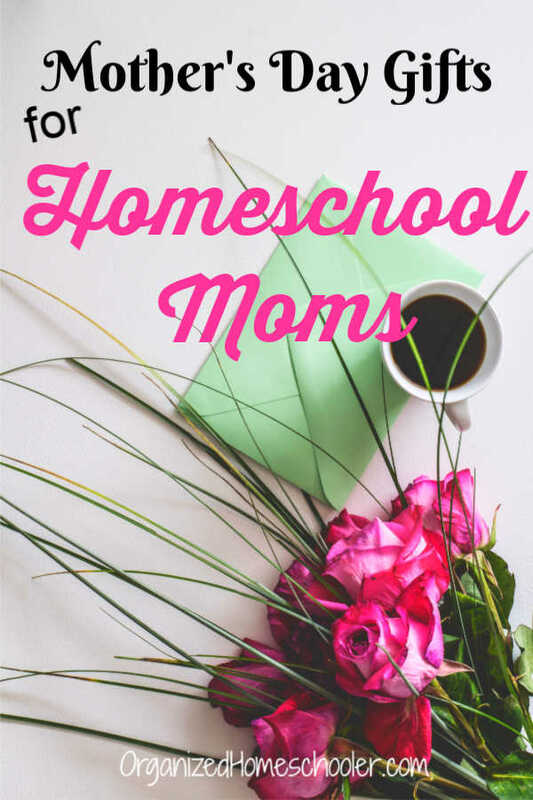 Gift the homeschool mom in your life a few new e-books. Every time we go to co-op, I bring my large tote bag. It contains lesson plans, books, small games, a computer, headphones, and a pencil-case. My Vera Bradley tote bag is the perfect size. It has held up wonderfully for the past 3.5 years. This bag also doubles as my field trip bag and my travel carry-on. The interior and exterior pockets keep everything organized. Farrier Leather bags are also an awesome choice for organized moms. I own the clutch and use it every single day because it transitions so easily from a clutch to a wallet to a cross-body purse. Moms love to display their children’s artwork and this frame makes it easy. The front of the frame opens up so you can quickly switch out the artwork. I store extra pictures inside of the frame. This is again an item that I personally own. Actually, I own two. I have one frame for each child. One of my favorite features of this frame is that I can pull out older artwork that is stored inside. It is a walk down memory lane. Years ago my husband helped my children make me custom artwork for Mother’s Day. They wrote what they love about me on a canvas and then painted pictures around it. It has had an honored place hanging among our artwork ever since. I love it because it is a reminder of how much they love me and how much they have grown. There is nothing better than seeing a sweet reminder that your children appreciate all you do for them. Personalized jewelry is a great way to show someone that you are thinking of them. It isn’t something that can be picked up from Target at the last minute. The recipient knows that advance planning went into this gift. Jewelry personalized with children’s names is sentimental and sweet. 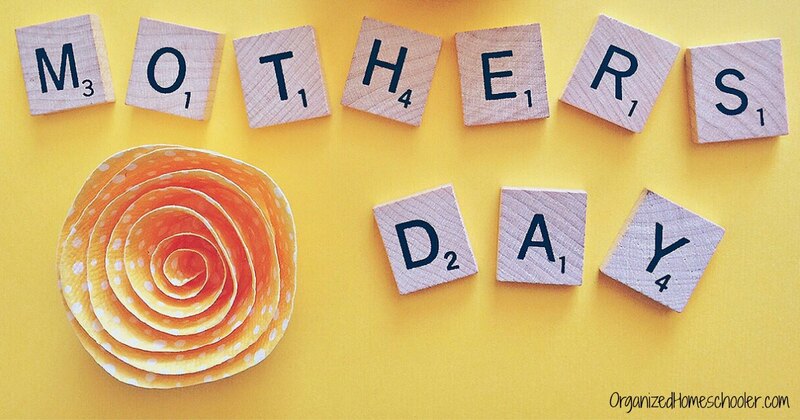 It is something a mom can wear and treasure forever. Dinner – I am a fan of any meal that I don’t have to plan or cook. A night off in the kitchen is always appreciated. Take it one step further by gifting your favorite homeschool mom a subscription to MyFreezEasy – a freezer meal planning service. 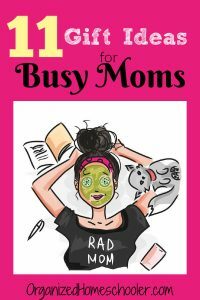 Sleeping in – Almost every mom I know is tired. A chance to sleep in and not need to listen for little feet hitting the floor is heaven when you are in that stage of life. Audible Subscription – Listening to books is a great way to get in extra reading time.